We seasonally pasture-raise turkeys. Our turkeys are never caged and spend their days roaming in the pasture and the orchard, hunting for bugs, seeds and grasshoppers. We are currently raising Broad Breasted White turkeys. These are the turkeys that you are probably accustomed to having at Thanksgiving dinner. They will have a large breast, and we expect their weights to range from 13 to 18 pounds. 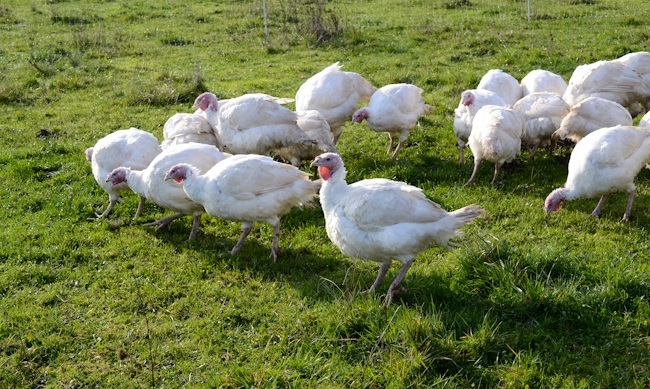 We receive our turkeys as day-old poults, free from antibiotics and vaccines. They are fed a similar Organic (No soy/corn) whole grain ration that our broiler chickens receive until they are moved at 4 weeks out to pasture to forage for insects and grasses. These turkeys develop an incredible flavor from natural foraging. They feed themselves on pasture, so their diet is much better than a typical factory farmed breed of turkey that has been developed to eat only feed and not move around much. While on pasture, they are still supplemented with the same whole grain ration. These turkeys are also beautiful, so schedule your appointment to visit the farm to check them out. Our turkeys eat no GMO feeds, receive no hormones and receive regular care. We care for our animals like family to make sure they are healthy and comfortable. The flock is free ranged throughout our farm. . We use no synthetic fertilizers, pesticides or herbicides of any kind on our fields. Our turkeys will be ready for eating in November. The Broad Breasted White is a larger turkey, and we expect them to dress out at 12 - 18 lbs. Supplies are limited, so please reserve your turkey(s) with a $25 deposit. Once your turkey is processed, you will be charged $6/lb. and your deposit will be deducted. For example, a 15 lb. turkey will cost $90 ($6/lb. x 15 lbs. = $90). Since you already paid a $25 deposit, your will only pay $65 upon pickup.